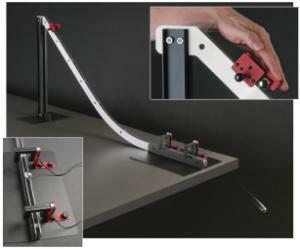 Simply roll a steel marble down the ramp mounted on a lab table, measure its velocity at the bottom, and then ask students to predict the landing point on the floor. Versions of this lab have been performed for years with make-shift ramps, inferior timing systems, with no or inconsistent release mechanisms for the ball. This new version from CENCO ensures your results are precise and your lesson hits the target. Suggestions for instruction and curriculum applications are included.